Visit us at the Waltham Farmer’s Market June 27! We’ll be handing out samples of this refreshing salad (recipe below) at the market, 119 School St., from 9:30 AM -2:00 PM. The mixture of flavors and textures – pickles and peaches – make this salad special, and the vegetables come from the Waltham Fields Community Farm. Refrigerator pickles are fun to make and can even be kept in the fridge for another use. Why not try making this at home? 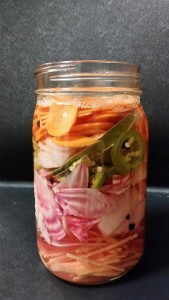 To make pickles: combine sliced vegetables in a glass jar. Bring brine ingredients to a boil in a saucepan and pour over vegetables. Refrigerate at least ten minutes and up to overnight. Drain and discard ginger, bay leaf, peppercorns. To make salad: Pulse dressing ingredients in blender until smooth. Combine greens, herbs, and pickles with enough dressing to coat. Refrigerate remaining dressing. Enjoy! 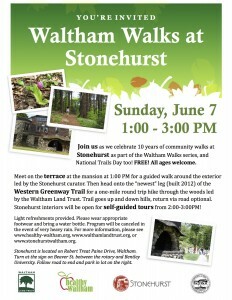 Join us for a walk at Stonehurst on Sunday, June 7, 1:00-3:00PM! We are celebrating 10 years of community walking events as part of the “Waltham Walks” series. FREE! All ages are welcome. We will meet at 1:00 PM on the terrace at Stonehurst, the Robert Treat Paine Estate. Enjoy a guided walk around the exterior of the mansion led by the Stonehurst curator. 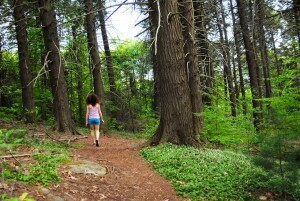 Then, head onto the “newest” leg (built 2012) of the Western Greenway Trail for a one-mile round trip hike through the woods led by the Waltham Land Trust. The trail goes up and down some hills, return via the road is optional. Stonehurst will be OPEN for self-guided tours from 2:00-3:00PM! Light refreshments will be provided. Please wear appropriate footwear and bring a water bottle. Program will be canceled in the event of very heavy rain. Stonehurst is located on Robert Treat Paine Drive in Waltham. Just turn at the Stonehurst sign on Beaver St. between the rotary and Bentley University. Follow the road to the end and park in the parking lot on the right. This walk is sponsored by Healthy Waltham, the Waltham Land Trust, Stonehurst, and the City of Waltham. We hope to see you there! Check out other places to walk in our “Waltham City Walks” brochure here. Healthy Waltham’s Executive Director (ED) has overall responsibility for the smooth functioning of the organization, including management of staff and programs, and execution of its mission and financial objectives. The ED reports to the Board of Directors. Provide leadership in developing program, organizational and financial plans with the Board of Directors and staff, and carry out plans and policies authorized by the board. Assist in the development and maintenance of a strong board of directors; serve as ex-officio of each committee, seek and build board involvement with strategic direction for ongoing mission work, maintain positive relationship with board members. Advocate for and promote change as related to HW mission in a diverse community. Work with the staff, Finance Committee, and the board in preparing a budget; see that the organization operates within budget guidelines. Jointly with the board of directors, conduct official correspondence of the organization, and jointly, with designated officers, execute legal documents. Hire, supervise and evaluate staff and interns. Oversee fundraising planning and implementation, including growing donor base, securing and managing grants, designing and implementing annual appeals and fundraising events, and administering fundraising records and documentation. Ensure that HW, its mission and activities, are consistently presented in strong, positive images to all stakeholders, including funders, partner and other community organizations, youth, families, general community members, and the media. Actively participate in regional, state, city and local level steering committees, subcommittees, coalitions and advisory boards. Healthy Waltham has been teaching kids at the Prospect Hill Terrace Learning Center about healthy snacks! The Learning Center is an after school program for kids age 5-12 who live in Waltham’s low income housing community. We’ve made fruit platters, granola, hummus, homemade microwave popcorn (just regular popcorn kernels in brown paper bags with assorted spice toppings) and veggie platters with this homemade low-calorie ranch dip. The Learning Center program is supported by Hannaford and the Vela Foundation. This yummy recipe was a big hit with the kids! 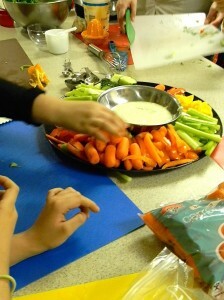 Cooking with kids is fun, and a great way to get them excited about trying new, healthy foods. 1. Combine all ingredients in a blender or food processor and blend until smooth. 2. Top with more chopped herbs for garnish (optional). 3. Serve with vegetable sticks or whole grain crackers or pita chips. 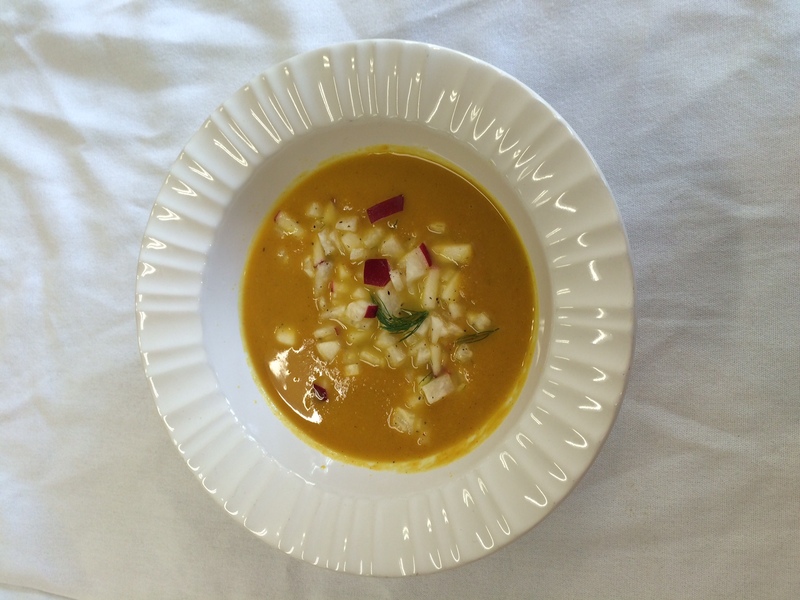 As the days get shorter and colder, warm up with this sweet and simple sweet potato apple and fennel soup topped with an apple and jicama slaw garnish. Adding apple and fennel keep this soup bright and refreshing while the sweet potato makes for a satisfying dish. 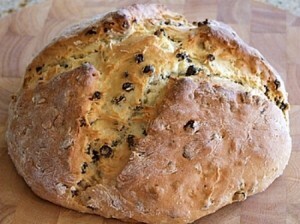 Serve with our version of Irish Soda Bread for a quick and healthy meal. Not familiar with jicama? Jicama is a tuber with a brown skin and white crispy flesh. It’s crunchy and refreshing with a mild sweet flavor; tastes like a cross between Asian pear, water chesnut and snap peas. It’s a great source of fiber and Vitamin C, and as it’s made up of about 80% water, it’s a refreshing bite on a hot day or a great pick-me-up on cold winter one. Click here for more information about jicama. Try this soup with a healthy version of Irish Soda Bread.